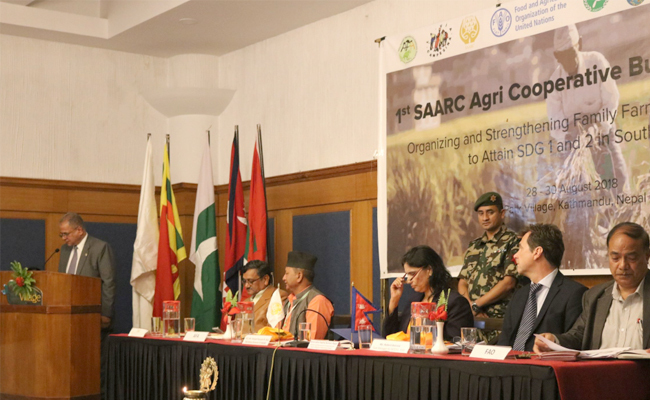 H. E. Mr. Amjad Hussain B. Sial, Secretary General of the South Asian Association for Regional Cooperation (SAARC) addressed the First SAARC Agri Cooperative Business Forum in Kathmandu this morning, 28 August, 2018. Devoted to the theme, Organizing and Strengthening Family Farmers’ Cooperatives to attain SDG-1 and SDG-2 in South Asia, the Forum was co-organized by Food and Agriculture Organization of the United Nations (FAO) and Asian Farmers’ Association (AFA) with the support from International Fund for Agricultural Development (IFAD). The three-day Forum brings together representatives both from the government and non-governmental entities from the Member States of SAARC as well as from regional and international organizations. It will conclude on 30 August 2018. In his statement, Mr. Sial also made a reference to the Declaration of the Eighteenth SAARC Summit, in which, SAARC leaders, inter alia, recognized the potential of Cooperatives in “achieving inclusive, broad-based and sustainable economic growth and development,” and called for “sharing of experiences, expertise and best practices in this sector.” He stated that following the inclusion of Cooperatives as an agreed area of cooperation, an intergovernmental process is underway for finalizing the SAARC Plan of Action for cooperation in matters relating to Cooperatives. Press release issued by the SAARC Secretariat, Kathmandu, 28 August 2018.